Okay, I was just complaining about the huge amount of advertising at the SF Giants’ stadium. 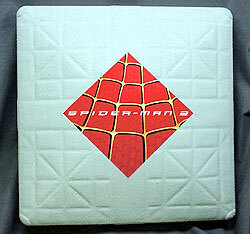 Then today I read that Major League Baseball is making a deal to get $3.6 million total for printing Spider-Man 2 logos on the bases. What the heck?? I don’t know about you, but I can’t even SEE the top of the bases when I’m in the stands. What a stupid idea!